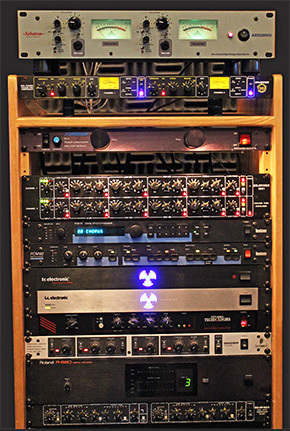 Tracking: Tracking and mixing are the most important elements to creating a great recording. We have a wonderful collection of mics, mic preamp and compressors and importantly, a very warm hard wood walled tracking room which has been properly treated with angles and a vaulted ceiling. Although we do not have multiple rooms for isolations of a loud band, for smaller venues and accustic instruments the space is fantastic. Your songs will be tracked by Billboard Reviewed and Top 10 Charting, 3 time NAMA Award Winner, Keyboard Magazine Album of the Year Winner producer & engineer Liv Singh Khalsa. His engineering and producing skills will guarantee your project to go smoothly with creativity, efficiency and technical proficiency. 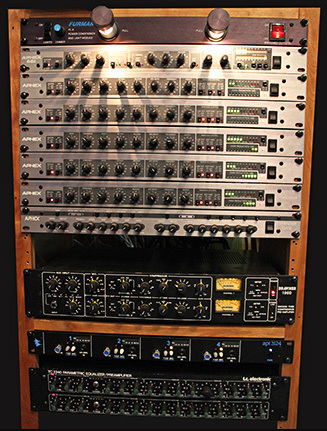 Recorded and Produced: Wiz Khalifa, Chris Ray, Bizzy Bone, DMX, Ken Mary with Alice Cooper and House of Lords, Jordan Rudess with Dixie Dregs and Dream Theatre, Lester Chambers with the Chambers Brothers, Ron Feurer with Diana Ross and the Fifth Dimension, Michael Dunlap with the Commodores, Zakir Hussan of the Maha Vishnu Orchestra, Jim Scott with Paul Winter Consort, Antion Vikram with Eric Burdon & the Animals, Steve Kujala with Chick Corea, Kim Robertson, Dashmesh, Alexis Holland, Tesz Millan, Singh Kaur, Snatam Kaur, Simone Awhina, Theresa Coe, GuruGanesha Singh, Ambika Devi, Ric Flauding, Chico Chism, Pete Thelan, PBR, Tony Redhouse, Tony Duncan with Nelly Furtado, Randy Kemp, Yoga Mint, PBS feature documentary Apache 8 Soundtrack. Heisman International, Broadway writer and composer Mike Reipka, Auburn University Football Music video soundtrack, Bata Ire, Yonatan Miller, Alexis Juliard and many others. Audio Studio (Sound proof room with hard wood walls and vaulted ceiling designed by EAR Pro Audio) gear includes: Trident 24 36X24 upgraded by Howard Dresen with 627AU OpAmps and Penny and Giles Faders mixing console - Tannoy Reveals Gold Monitors - JBL LSR305 and LSR310S Sub - Yamaha NS-10M - 550 Point Balanced Patch Bay - Sony APR 5000 Reel to Reel - Otari 5050 MX and Denon DH-510 Analog Tape Machines, (2) Dolby A 362 - API 3124 Mic Preamp - Sebatron Axis 200VU Mic Preamp - Ross Martin PCM4222 Converter - Drawmer 1968 ME Compressor - (2) Drawmer 1961 Tube Equalizers - Hand Crafted Laboratories Varis Tube Variable S Compressor - (4) Moog 500 Series Ladder Filters - Moog 500 Series Analog Delay - (7) Aphex 651 Expressor Compressors - (2) Aphex 612 Expander / Gates - Aphex 661 Tube Compressor - Valley People Dynamite 2 Compressor - DBX 163X & 166 Compressors - Studio Technologies Mic Pre Eminence - Peavey VMP-2 Tube Preamp - TL Audio Ivory PA-5001 Valve Pre-Amplifier - (2) Drawmer DL241 Compressor / Limiter upgraded with ua 4558c op amps - (2) Roland R-880 Quad Digital Reverb - Lexicon PCM 60 - (2) Lexicon PCM 70 - Eventide H3000SE Ultra Harmonizer - Boss RV-70 - (4) 24 Channels Motu 1224 24 Bit Digital Converters with Black Lion Upgrade and Micro Timer MK2 - Orban 536A Dynamic Sibilance Controller - (2) Drawmer 1960 Tube Mic Pre-amp / Compressors - Studio Tech AN-2 Stereo Simulator - TC 2240 Parametric Equalizer - DBX 2215 Equalizer / Limiter - VSS3 Stereo Source Reverb - MD3 Stereo Mastering - DVR2 Digital Vintage Reverb - UnWrap Stereo to Surround Conversion - Power Mac Pro 8 Core, Mac G5 and G4, 4B Bryston Power Amplifier and (2) Fostex 5030 Line Amplifiers. Audio Software: Pro Tools, Motu Digital Performer, Apple Soundtrack Pro 2, Roxio Toast, Waves Renaissance Gold Plus Suite and Essentials Bundle, Vertigo VSC-2, Slate Digital VCC, Slate Digital Virtual Tape Machine, Waves REDD, Waves MPX, Slate Virtual Buss Compressor, Antares Auto Tune, Sonnox Oxford Plug-in Bundle, OekSound Bundle, iZotope Studio package, Sound Radix Bundle, Metric Halo Bundle, Leapwing Audio Mastering tools, Klanghelm Bundle, DMG Compassion and Equality, T.C. Powercore Platform with System 6000 Mastering Plugins, Waves RS56 Universal Tone Control passive EQ, Tubetech CL1 B Compressor, VSS3 & MD3 Reverbs, Tap Factory, TC-Helicon Harmony 4, Intonator, Voice Modeler, Noveltech Character, 24/7-C, Classic Reverb, Dynamic EQ, EQsat Custom, Mega Verb, Tubifex, Channel Compressor-Limiter, Voice Channel, TC Restoration Suite, Fabrik C, Fabrik C, Wave Factory Track Spacer, Nomad Factory Pulse-Tech Equalizer set and Slate Trigger Platinum Phase Accurate Drum Replacement. Mics include: (3) AKG 414 EB Brass Diaphragm (Classic) - (6) Sennheiser MD740 - (2) Advanced Audio CM1084 - AEA R84 Ribbon - Advanced Audio CM49 (Neumann M49 clone) - (2) Beyer MC740 - Neumann TLM 103 - (2) M Audio Sputnic - Beyer Dynamic M201 TG - (2) Nady RSM-3 Ribbon Stephen Sank upgraded with RCA 44 spec ribbon with Cinemag transformer and CloudLifter pre-preamp - Beyer Beyerdynamic M500NC Ribbon Stephen Sank upgraded with RCA 44 spec ribbon with Cinemag transformer and CloudLifter pre-preamp - (2) Beyerdynamic M201 TG - Beyer Dynamic M 88 TG - Audix D6 - (2) Shure SM57 - Crown GLM 200 - (2) Sennheiser MD 504. Keyboards include: Moog Sub 37, Arturia MiniBrute, (2) Yamaha 802, Roland XV-5080, Roland JP-8000, (2) Roland S770, Roland JD-800, Korg Karma, Spectrasonics Stylus RMX, Symphonic Instruments, Sample Tank, Philharmonik, Trillian, Atmosphere, Omnisphere with Bob Moog Tribute Collection, Kontakt, Bias Peak, BPM, Pianoteq 6 with all add-ons, BPM, Native Instruments Battery, Motu Mach Five, UVI Vintage Legends Iconic Synth Collection, Access Virus, Sugar Bytes Unique, and TC V Station. Rates: For larger project call for a complete project bid.